In 1996, "Junk" was changed to "Dismantler". 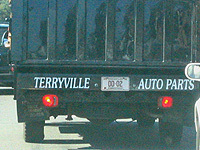 Sometime in the early/mid 2000s, a new type was introduced - "Dismantler Vehicle In Tow". These plates are the same colors as Dealer/Repair plates for the year. Because there are so many words on these plates (along with the Connecticut state name on the bottom) the dies for the numbers appear to be those formerly used on Motorcycle plates. Note the odd die used for the second "9". This one has green paint all over it, but I don't think it's worth bothering to clean it off. 1997 was the last year for the "Junk" type - replaced by "Dismantler" starting with the 1998 expirations.